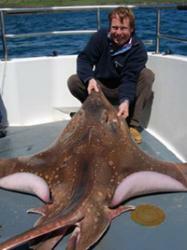 One of the team with a skate - showing its size. © Luke AstonMarine scientists working in the Celtic Sea have discovered a natural refuge for the critically endangered flapper skate. The study reveals that such refuge areas in the Celtic Sea support at least ten species of elasmobranch, including the rare blue skate (Dipturus flossada) and related flapper skate (Dipturus intermedia). Dipturus was previously considered to represent a single species (D. batis), but made the news in 2009 when a case of misidentification was revealed (BBC news: Science/Nature). Both species are now listed as critically endangered but populations of the flapper skate, which can grow up to 2.5 metres in length, are considered to be under greatest threat from extinction. European Union regulations mandate that fishermen throw back any flapper skate but its slow growth and reproduction mean that even very low levels of fishing mortality are now unsustainable for this species. Scientists from Queen’s University Belfast, Bangor University and the Irish Marine Institute carried out the study. Lead researcher Dr. Samuel Shephard suggests “the discovery of a Celtic Sea stronghold for flapper skate provides a remarkable opportunity to help save a species on the verge of extinction”. Professor Michel Kaiser, Chair in Marine Conservation at Bangor University added “some have previously argued that areas of little interest to the fishing industry are not worthy of conservation, however this study clearly overturns that perception and highlights just how important some of these areas are”. Importantly, the fishing industry has reacted positively to the ‘win-win’ situation that areas of little commercial interest have potential as important marine reserves. Professor Dave Reid presented the information to industry leaders, and this has led to the inclusion of these areas in proposed management plans for elasmobranchs in the Irish and Celtic Seas. Eibhlín O’Sullivan, CEO of the Irish South &West Fishermen’s Organisation responded “The Irish Fishing Industry has been working with the Marine Institute for the past 18 months on developing a management plan for Skates and Rays. This new research adds valuable information for the identification of potential seasonally closed areas”. Professor Reid noted “this is a great model for collaboration on conservation between the fishing industry and scientists”.